Google has a new service to help you out with reading articles from your favorite websites and RSS feeds. 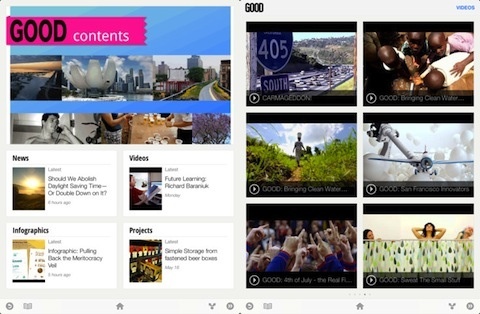 Google Currents is an iPhone application that takes news feeds from selected websites and presents them in an interactive magazine format. There’s also a section for trending topics, which pulls multiple articles for a single topic into it’s own list for your reading pleasure. The best part: the app is free of charge, so there’s no reason not to download this iPhone app and give it a try. 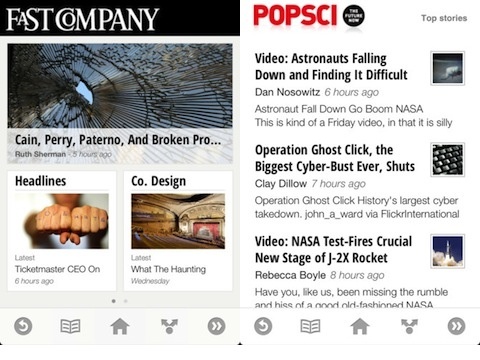 Google Currents is similar to other news aggregation iOS apps including Flipboard and Zite. Once you open Google Currents for the first time, you’ll need to sync it to your Google account. If you don’t have one, it’s easy to make one on the fly. Afterwards all you have to do is search for you favorite sites, add them to your in-app library and wait for them to sync up. The look of each list depends on if their site supports the service. Some sites will have dedicated sections for articles and videos while others will come up as one long list. Once you select something to read, the experience is no different than an e-reader. You can also change the font size and whether you want to use mobile broadband and/or WiFi for background syncing. The only drawback is that not every website’s news feed looks great through the Google Currents app. While Reason and The Daily Beast look great with dedicated sections, TMZ and Kotaku only have a single list for their content. It gets worse when you try to add websites on your own. When trying to add a site such as CNN or Fox News, there are multiple RSS feeds that pop for each section of their sites. This can be a downer for those who wish to add not-so popular sites. You can grab the iPhone app (which also works on the iPad and iPod Touch) for free through the iTunes app store. Overall, Google Currents is great for viewing websites that you enjoy reading on a daily basis. It’s definitely worth trying if the ones you visit are driven by Adobe Flash instead of HTML5 or if the mobile version is not worth logging into. Hopefully, more outlets will take a look at this and optimize their feeds to work better with this. In short, Google Currents is a breath of fresh air in the realm of news applications. AppSafari review of Google Currents was written by Darius Reimm on December 12th, 2011 and categorized under App Store, Feeds, Free, iPad apps, News, Productivity, Reading, Universal. Page viewed 5013 times, 1 so far today. Need help on using these apps? Please read the Help Page.